PepperTap was an on-demand hyperlocal grocery delivery startup based out of Gurgaon(Gurugram). 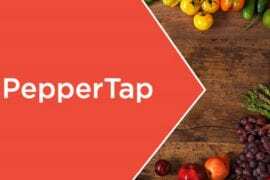 PepperTap began its journey on November 2014, by Navneet Singh and Milind Sharma. PepperTap was started with a vision to revolutionize grocery shopping; No more queues, No more parking hassles, No more bargaining with sabzi-wallahs. They worked on “100% Inventory-less” model, wherein they bought the existing inventory in local stores online to their app. They had a great start, operating in around 31 cities and they were processing on an average of 20,000 orders per day. They became one of the largest player in India in online grocery delivery business within a year of operation. They raised total of $51 million dollars from various investors like Sequoia Capital, Saif Partners, Snapdeal etc. within 15 months of their operation. In September 2015, the company closed their operations in Agra and Meerut after a month of pilot run. PepperTap entered Tier III cities to test the ground and found its not profitable and had to quickly exit the market before losing much money. In February 2016, PepperTap halted operations in 10 cities including metros like Mumbai, Chennai and Kolkata and it laid off around 400 employees as cost-cutting activity. They were focusing only on cities like Delhi, Gurgaon, Noida, Hyderabad, Pune, Ghaziabad, Faridabad and Bangalore which accounted 70% of their revenues. Finally, in April 2016, PepperTap pulled its plug off from its cash burning grocery delivery business. PepperTap was so much focusing on pumping money to on-board customers they failed to take care of their technology. The integration of their app with their partner stores was not great, sometimes customers were unable to see the entire selection of items from a store and sometimes even essential items were missing from the catalogue visible to them. In an interview the company’s co-founder Navneet admits, “In the race to pepper the whole country with PepperTap, we had brought too many stores online far too quickly.” And they didn’t plan the scalability of the product and operations accordingly. E-Commerce in India has a got a brand that it has to be cheaper than physical store for the people to buy. To keep enticing customers to buy from their platform, they were spending a lot of time and energy to devise clever sales and discount schemes. To attain the loyal customer base and outpace the competition they were unrealistically spending money on discounts, which burnt their bank balance. PepperTap was working on “100% Inventory-less” model, which means the company has to pay the MRP from local stores; bear the cost of delivery, technology, operations etc. and still give the products at discounted price to its customers. There is no way PepperTap could achieve profitability. For e.g. The startup raised $51million in 15 months of operations, i.e., roughly $1,00,000 per day. If they have 20,000 orders per day with the loss of Rs. 200 per order (on discounts and cost of team) it calculates to loss of approx. $60,000 per day. The business of raising $1,00,000 per day with the loss of $60,000 per day clearly doesn’t make sense. If 2015 was the year when VC’s opened their purse strings for any idea with even the most remote potential, 2016 was different. It started with Flipkart’s valuation being clipped by Morgan Stanley, followed by Zomato’s valuation and investors were suddenly being a lot more circumspect with their cash. And PepperTap had no different fate, they couldn’t raise more funds to run their show. Instead of focusing on gaining customers quickly by giving away discounts, PepperTap could’ve focused on solving smaller challenge first and develop a profitable and sustainable business model. PepperTap launched 2 hours delivery model in Tier III cities. It rarely takes more than 10 minutes for shoppers in Tier III cities to go to a store to purchase their things. Therefore, PepperTap’s two-hour delivery service wasn’t very enticing in these Tier 3 markets, where customers have far more time at their disposal and are generally not in a hurry. Instead, PepperTap should have focused its efforts on perfecting logistics in Tier 1 cities where customers would have been more responsive to PepperTap’s service promise. They could’ve followed their competitor’s business model of building own inventory system and building their own branded products. Although it comes with challenge of maintaining the inventory, avoiding waste etc. there could be a way to achieve profitability. Most of the PepperTap’s competitor had no different fate, the startups like LocalBanya, Ola Café, Flipkart NearBy, Townrush, PayTm etc too have pulled their plug in grocery delivery business as they couldn’t survive. Only startups which have survived and are doing good are Grofers and BigBasket. Unlike other players BigBasket follows inventory model and it raised $150million in March 2016 and they are processing around 35,000 orders per day. The company has pivoted to be a full stack e-commerce logistics company. PepperTap’s parent company Nuvotex Logistics was already running reverse logistics arm while operating PepperTap. ⟵OneWallet – Go Online, Pay Online.